Registration for the 2009 Youth Climate is closed but schools, universities, parents and children can follow the two-day event via a live stream. Conceived by then 17-year-old Zachary Berger of Lake Placid after attending the Adirondack Climate Conference last year, this year’s summit illustrates to all young people that their opinions and ideas can make a difference. After much anticipation the Adirondack Youth Climate Summit will be held November 9th and 10th at The Wild Center in Tupper Lake. The 24 attending high schools and colleges will each send a team of students, educators, administrators and facilities staff to develop a feasible carbon reduction plan that decreases energy consumption and greenhouse gas emissions to bring back to their schools and communities. Zachary Berger, inspired by the Adirondack Climate Conference held at The Wild Center in 2008, contacted conference planners to organize a similar gathering exploring climate change and its effect on the Adirondacks for the youth of the region. In early 2009, a steering committee, comprised of students, educators and The Wild Center staff, formed to bring Zach’s vision to fruition. The Youth Climate Summit’s goal is multilevel, according to ADKCAP (Adirondack Climate and Energy Action Plan). The Summit will hold educational plenary sessions where research-based information will be presented about the economic and ecological effects of climate change. Participants will learn strategies to address climate change in the Adirondacks and how, when applied, communities will benefit monetarily. Workshops are scheduled throughout the two-day event pairing students with experienced personnel to develop training skills to inspire participants to engage others to “green their schools and communities.” Through hands-on activities members will learn team-building skills in the hopes to engage classmates and coworkers in a grassroots effort to make their schools energy-efficient. During this process teams will develop a carbon and cost reduction plan to bring back to each school. The following high schools and colleges are attending this inaugural year: Chateaugay Central School, Clifton-Fine Central School, Colton-Pierrepont Central School, Elizabethtown-Lewis Central School, Green Tech Charter High School, Heuvelton Central School, Keene Central School, Lake Placid High School, Madrid-Waddington Central School, Minerva Central School, Moriah Central School, Morristown Central School, Newcomb Central School, Northville Central School, Ogdensburg Free Academy, Plattsburgh High School, Potsdam High School, Saranac Lake Central School, St. Regis Falls, Tupper Lake Central School, Clarkson University, Colgate University, North Country Community College, Paul Smiths College, St. Lawrence University and SUNY Potsdam. The Adirondack Youth Climate Summits are scheduled through 2011 to monitor the success of each climate action plan. There will also be the opportunity for those Adirondack schools that watch the live web stream to participate in future summits. The complete schedule information is available here. To us, Big Game Season means something other than hunting. I’ve never been hunting and make an active choice not to be part of the hunted. With that decision comes the autumn neon wardrobe introduction and fashion faux pas but I am doing what I can to keep my family safe. Our lovely orange vests are kept conveniently in the car so I can cloak child or dog in festive array. In the Northern Adirondacks, Big Game Season starts this Saturday (October 24) and runs through December 6th. The first of many safe walks I’ll be posting is the 12-acre lot in the heart of Saranac Lake called The Pines. The Pines is an area dedicated to the memory of Dr. Lawrason Brown, a pioneer in tuberculosis in the late 19th Century. The 12-acre plot is owned by the Saranac Lake Voluntary Health Association (SLVHA) and was deeded in 1937 to the organization while it was still called the Saranac Lake Tuberculosis Society, Inc., hence the connection to TB and Dr. Brown. SLVHA is a not-for-profit organization established in 1897 that continues to provide healthcare initiatives and scholarships for Saranac Lake residents. Their property, known as The Pines, consists of a network of trails and old roadways easily accessible from any of three points. The first entrance is on Pine Street diagonally across from the railroad track crossing. Entrance two and three are on Forest Hill Road and Labrador Lane, off Moody Pond. The trails are a mild walk with the most challenging hill being the entrance on Pine Street. The Pine Street entrance is a moderate incline to a then flat open path that runs along as esker. There is no view along these wooded paths, just a beautiful trail under a canopy of trees. Somewhere hidden in the forest is the stone foundation of an old social club. There is no trail map or marked path available, but it doesn’t seem to make a difference. Each path seems quite short, less than a ¼-mile, intersecting and weaving together. The wide, flat path is easy enough to maneuver a jogging stroller or even the toddler venturing out on his/her own. Volunteers maintain the trails so please carry out what you carry in, even the half-full coffee cup set carefully to the side of the trail. The Pines is open to the public, though some restrictions do apply like no camping or motorized vehicles. Please be respectful of other people’s land as private property surrounds The Pines. Please heed the No Trespassing signs. For more information contact SLVHA at 518-891-0910. We are huge fans of live performances whether musical or theatrical in nature. My children dress up and put on long, sometimes arduous, routines where we usually have to break for intermission. They are not formal in their script. They only require an avid audience because that is what they give when they go see a performance. For our household watching a professional performance has many additional benefits to the live show. The scripts are reenacted for days after highlighting the favorite bits. Questions are asked about stages, costumes and lightening. Conversations are initiated about the story line. Even the music or soundtrack make guest appearances in our house. The children are entertained and feel the need to continue to entertain long after the curtain has closed. For the month of October Pendragon Theatre is in residence at the Lake Placid Center for the Arts for what is being billed as Fall Foliage Theatre. The three remaining performances are not all for the very young. If a good babysitter is available then there is no reason to forego these last few remaining performances. The Wizard of Oz is a beautifully streamlined production that allows the audience to focus on the various characters and dialog. The theme is still relevant today that “there is no place like home.” If children have seen the classic film there will be differences. This is not a musical, the sets are simple and the journey is one of imagination. There are still plenty of quests for a heart, a brain and some courage and least I forget, the best-loved message that there really is, “no place like home.” That still holds all the power with a simple click of Dorothy’s ruby slippers. Lastly the comedy Candida is performed in its entire original Victorian splendor as two men vie for the love and loyalty of Candida. Written by playwright George Bernard Shaw, winner of the Nobel Prize for Literature in 1925, Candida must choose her husband or the much younger poet. Clever and witty dialog stands the test of time. So bring the children (to OZ) or take a much-deserved night out and enjoy a Pendragon performance, the Adirondack’s only year-round professional theatre. All evening tickets are $14.00 for adults and $12.00 seniors and students. Oz tickets are $10.00 for adults and $8.00 for children ages 15 and under. Call LPCA for reservations at 518-523-2512. Bus Stop by William Inge: October 16 (Friday) and October 17 (Saturday) at 8:00 p.m. The Wonderful Wizard of Oz: the classic L. Frank Baum story adapted by Michelle Vacca: October 18 (Sunday) at 2:00 p.m.
Candida by George Bernard Shaw: October 23 (Friday) and October 24 (Saturday) at 8:00 p.m. This year we will be hunting space aliens in Gabriels. Yes, crop circles have been found in the Adirondacks, though this time they can be proven the direct result of human effort, not the paranormal. For the fourth year in a row the design for the maze at Tucker Farms is from the artistic work of Scott Rohe. He didn’t even have to perpetuate any crop circle myth by going out in the dead of night to complete the large-scale land art. He just came up with the design so the Tuckers could plant the corn in a grid-like pattern. » Continue Reading. If you have not had an opportunity to visit the Adirondack Museum yet this season I am here to pave the way with offers of free admission and coupon savings. Okay, it isn’t money falling from the sky but if you attend Smithsonian magazine’s free museum day money may just jingle in your pocket. Though with or without Museum Day the Adirondack Museum is a bargain any day of the week. In its fifth year Museum Day is an annual event taking place across the country on September 26th. More than 900 participating museums will offer free general admission to an attendee and guest with a Museum Day admission card. The Adirondack Museum at Blue Mountain Lake is just one facility that is participating. A complete list by state can be found at Smithsonian magazine. The Adirondack Museum houses twenty buildings on 32 acres of land, beautiful gardens and ponds. There are many interactive elements like the Rising Schoolhouse filled with paper crafts and era-specific wooden toys, a treasure hunt in the “Age of Horses” building, or build a toy boat at the Boat Shop. Since that barely touches on the activities available, keep in mind all admissions are valid for a second visit within a one-week time period. If unable to attend Museum Day, The Adirondack Harvest Festival will be held the next weekend, October 3rd and 4th. A good tip for all: year-round residents of the Adirondack Park are admitted free all days that the museum is open in October. This festival will provide wagon rides, music and even a traditional blacksmith demonstration by David Woodward. There is a barn raising, cider pressing and pumpkin painting. If just having fun isn’t enough there are altruistic opportunities as well. Have children bring canned or dried goods to support the Warren–Hamilton Community Action Harvest Food Drive. Please call 518-352-7311 for more information. Open daily from 10:00 a.m. – 5:00 p.m. until October 18. If you visit the museum website, click on the monthly special icon for a coupon good for $2 off one adult admission. There is no charge for children under six. Even with discounts, coupons and free admission museums need to function so keep in mind that even on free days a donation (no matter the size) is probably greatly appreciated. 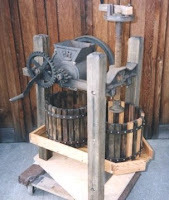 Photograph of an antique cider press. School has started and it is a year beginning with “I know.” My children know they need to make their beds, they know they need to brush their teeth and they know we are going go for a walk after school. Someday I’ll just toss it out that we’re having dirt for dinner just to see if they are listening. They may not really know where we are going but I know they’ll enjoy it just the same. Running, walking or just enjoying the view, the Red Dot Trail near Paul Smith’s College is an easy walk for anyone. Even if one doesn’t wish to venture around the whole loop there are beautiful bridges that cross over canals connecting Church, Little Osgood and Osgood ponds. The trails are wide enough to let my kids navigate by themselves, giving me a few random moments of solitude. We are fortunate to see a few paddlers maneuvering through the canals. My children are compelled to offer advice concerning low branches and buried rocks. There are many herd paths leading on and off the marked trail. There is even a section that intersects the Jack Rabbit Trail. We remind the kids to wait at the junction. They are out of sight before the exclamation point has been placed at the end of the sentence. They seem to be practicing the boomerang approach. The kids create a wide berth in a frenzied run and then quickly shoot back to us. I know with each passing year the return time is longer and longer. The Red Dot Trail can be accessed from the Osgood Pond Waterway on White Pine Road. From the Route 30/86 junction in Paul Smiths continue onto Route 86. Drive about .5 mile and turn left onto White Pines Road off Route 86. The parking entrance and beach is .25 on the left. The trail is an easy 2.5 round-trip that begins at the boat launch area. For additional activities bring a bathing suit to take a quick dip into Osgood Pond, bring a lunch and enjoy it at one of the four lean-tos or just wade in and look for fish and other wildlife. This is the final weekend to have breakfast with the merry old elf before he starts working overtime. So if you are planning a visit to Santa’s Workshop in Wilmington, N.Y., September 5th is the last opportunity for the season to join Santa and his friends for breakfast at Mother Hubbard’s Cupboard. The buffet is offered only on Tuesday, Thursday and Saturday. The price is a reasonable $8.95 for children 12 and under. Admission to the park is not included. The Christmas theme is carried throughout the park with a Sleigh Rollercoaster, Tree Ornament Ride, Peppermint Swing, and Candy Cane Train to name a few. Since 1949, Santa’s Workshop has been providing families with wintery fun all year long. The brainchild of Lake Placid businessman Julian Reiss and designed by Arto Monaco, Santa’s Workshop became the summer home of Mr. and Mrs. Claus. It has been touted as the first theme park. Make sure to check in at the North Pole Railroad Station because the entry fee is good for a second consecutive day. For those other parents with lift ticket mentality (dividing the number of runs taken by the cost of the ski ticket) having the opportunity to come back another day will take some pressure off trying to fit in all that Santa’s Workshop has to offer. Catch some of Santa’s friends performing at Mother Goose’s Guild or watch a puppet show at the Jack Jingle Theatre. Wrap up the tour with a trip to the barn to feed the reindeer. Children can even participate in a parade to Santa’s House where they can have a sit down with St. Nick. Santa’s Workshop is located in Wilmington, NY. Call 800-806-0215 for directions. Please remember if your visit is incomplete, you may request a re-entry pass for the next day at the post office. Photograph of cast members at Santa’s Workshop. I was just given a secret at a recent trip to the Farmers’ Market that if I de-seed the giant green squash first and then chop, it will retain its sweet flavor without having to attempt to swallow seeds the size of cherry pips. For my children a trip to the Farmers’ Market is a day out on the town. Not because it is errand day. More so because most open-air markets are designed for just that purpose, for people to stroll, smell and experience where food comes from. Sadly and not surprisingly some kids never know the vast amount of travel some of their vegetables have taken before reaching the table. Lake Placid’s Green Market Wednesday is one of many “producer-only” farmers’ markets. The requirement is simple. The product is either grown at the vendor’s location or made from scratch. Vendors are not allowed to purchase products to resell to customers. This policy provides a creative atmosphere for local farmers and artisans to explore new possibilities with their produce and merchandise. For us, we show up with little more than water bottles and pick our lunch like it’s right off the vine. Oh wait, it is! The kids weave around the various booths choosing a piece of fruit here and a piece of cheese there. August 26 will be the last Wednesday Young and Fun series located at the Lake Placid Center for the Arts that runs in conjunction with this particular outdoor market. This is a Salute to Art Day! Clowns, musicians, face painting and crafts are just part of the family-friendly activities available. Enjoy the market while the children are entertained. Buy a fresh meal while figuring out whether your zucchini toting neighbor is friend or foe. For a complete list of all Adirondack and beyond Farmers’ Markets check out www.adirondackharvest.com. For a list of producer-only venues, see below. Lake Placid Green Market on Wednesdays from 9:00 a.m. – 1:00 p.m.
Schroon Lake on Mondays from 9:00 a.m. – 1:00 p.m.
Plattsburgh Farmers Green Market on Thursdays from 3:00 p.m. – 6:00 p.m.
Essex on Sundays from noon – 4:00 p.m.
Saranac Lake on Saturdays from 10:00 a.m. – 2:00 p.m.
Queensbury on Mondays from 3:00 p.m. – 6:00 p.m.
Saratoga Springs on Wednesdays from 9:00 a.m. – 1:00 p.m.
We have no set standard for musical appreciation in our family. We have always run the gamut from Broadway soundtracks to jazz, classical to rock. We are (thankfully) well past the refrains that require an “oink, oink here and an oink, oink there.” Though each childlike step through those mind numbing repetitive refrains did serve its purpose whether to learn what happens as the wheels turn on a bus or learn all the sounds the animals at Old MacDonald’s Farm. As parents of young children we do have ultimate control of the car stereo and able to intersperse nursery rhymes with an eclectic mix of music. From The Grateful Dead to Marcia Ball and Cole Porter to Pavarotti, our kids are being exposed to a variety of musical tastes. I’ve always used music as a means to set the mood whether we are dancing around the house, quietly working or keeping the peace. My daughter knows our wedding song while I am, much to my chagrin, prolific at singing and performing the Hannah/Miley “Hoe-down/Throw-down.” Listening to classical music is one thing but going to the opera is not an everyday occurrence for this family. Perhaps it should be. George Cordes, an operatic bass, has performed a variety of roles while with the New York City Opera, Metropolitan Opera and other operatic companies. He will be accompanied by his wife and pianist Elizabeth as they perform at the Long Lake Town Hall at 7:00 p.m. this Saturday. 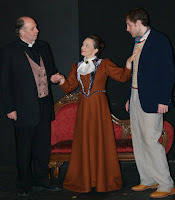 The husband and wife team are of the newly formed High Peaks Opera Studio of Tupper Lake. The Cordeses will perform musical cocktail ranging from the Great American Songbook to scores from Gilbert and Sullivan’s Operettas. Admission for the event is only $5.00 while children 12 and under are free. If the low cost doesn’t get you to come then the offer of dessert and refreshments should. My children are excited to see someone who performed on stage. I’m glad to oblige. Free. Now that’s a four-letter word that I don’t mind my children saying. As a matter of fact I encourage it with wild abandon. With the rain winning the weather wrestling match, inside alternatives are wearing thin. Even the sunniest of personalities isn’t always enough to break through a ten-day forecast of rain. Fortunately there are many options available to get kids (and the rest of us) out of the house. The Ticonderoga Heritage Museum continues with its bi-weekly workshops offering “A Champlain Summer” of free children’s activities. The museum has tied into the 400th anniversary of Samuel de Champlain’s travels to the lake graced with his name. The Museum has taken on the task to encourage kids to come and find out what other children were doing for fun 400 years ago. My son informs me that it is considered work if you have to make something. Somewhere we have picked up a consumer. Really since when is it considered hard labor to make a block print t-shirt? Sounds like fun to me. There is a theme for the last few events. Kids can design a Native American tee shirt on August 5th or learn about life as a Native American child and make and eat a corn meal treat on August 7th. Next week brings weaving projects on the 12th and rattles (to ward off evil spirits) on the 14th. The events take place every Wednesday and Friday from 9:00 a.m. – 10:15 a.m. and are free. The Heritage Museum is on the corner of Tower Avenue and Montcalm Street. Across Montcalm Street and directly after the museum’s activities, are more free activities. The annual Ticonderoga Festival Guild is holding its 30th Arts Trek Children’s Series. These morning events are on Wednesdays at 10:15 a.m. so you’ll have to scurry to see it all. Since 1980 the Festival Guild has been dedicated to promoting the performing arts to the community at large. If you still have any energy left complete the loop with a wander to Bicentennial Park, which abuts the Heritage Museum property, and enjoy a romp at the playground, see the waterfall or if it rains hide under the covered bridge or gazebo.